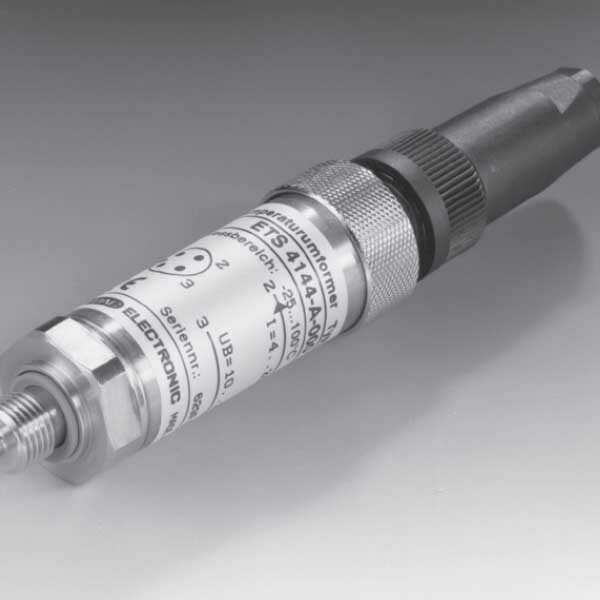 The ETS 4000 is a robust electronic temperature transmitter. It particularly serves for measuring temperature in hydraulic applications in industry. First of all, the temperature sensor is capable of measuring temperatures in the range -25 °C to +100 °C. Indeed, this evaluation is based on a PT 100 and corresponding evaluation electronics. What’s more, the sensor has analogue output signals of 4 .. 20 mA und 0 .. 10 V available as standard to enable integration into modern controls. Furthermore, the pressure resistance up to 600 bar and excellent EMC characteristics make the ETS 4000 ideal for use in harsh conditions.